Isaw is a Filipino street food that can be found in almost every nook and cranny of the country. It is made up of pig or chicken intestines that are grilled and basted with a marinade sauce. Isaw is then dipped into a spiced vinegar sauce to bring out the flavor and for added spice. 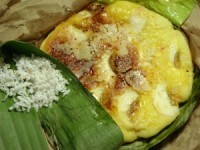 Bibingka is a rice cake that is cooked by placing hot charcoal above and below the batter placed in banana leaves. It is traditionally eaten during the Christmas season along with puto bumbong. It is topped salted egg, cheese, butter/margarine and/or grated coconut flakes. 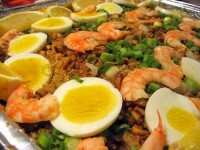 Pancit Malabon is a type of noodle dish that originated from the City of Malabon. It bears a yellow-orange color because of the sauce that they use to flavor this dish. Because Malabon is near the fish ports, the toppings used for this dish are mainly seafood. Pork and egg are also added for garnish and extra flavor. Batchoy is a noodle soup made with pork organs, crushed pork cracklings, shrimp, vegetables, chicken stock, chicken breast, beef loin and round noodles. Its origins can be traced to the district of La Paz, Iloilo City in the Philippines, hence it is oftentimes referred to as La Paz Batchoy. 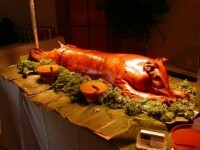 Lechon is a whole pig slow roasted over charcoal by putting a long bamboo stick in the mouth and out the back. It a is staple dish that is present in special occasions such as fiesta, weddings, baptisms, and more. It served with a liver-based sauce and eaten as a main dish. 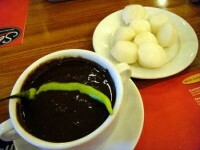 Dinuguan or Blood Stew is a dish wherein pig or cow’s blood is cooked with meat and other ingredients. This is considered as an authentic Filipino food and is best eaten with steamed rice buns called “puto”. 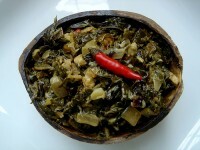 Laing is Bicol region’s unbeatable dish. It is an appetizing spicy vegetable dish in which taro or gabi stalks and leaves are slowly cooked in coconut milk seasoned with ginger, shrimp paste and Philippine chili. It served with rice and can be eaten as a side dish or a main dish. 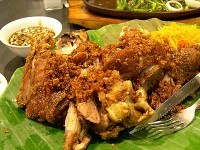 Crispy pata is a Filipino dish consisting of deep fried pig trotter or knuckles served with a dip, a soy-vinegar sauce. It can be served as party fare or an everyday dish. Many restaurants serves boneless pata as a speciality. 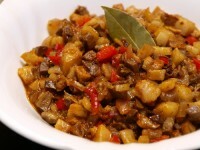 Bopis is a spicy Filipino dish made from minced pig’s lungs and heart. This can be served as an appetizer for beer and alcoholic beverages; it is also considered as a main dish and is best served with steamed white rice. Champorado is a popular breakfast dish that is made with glutinous rice and Tabaleas de Cacao. It is commonly drizzled with evaporated milk that is poured over generously to counter the taste of the bittersweet chocolate.